Thomas Robinson Architects' involvement in the highly-acclaimed Avenel development at Kilmacolm continues to earn recognition across the industry. Following awards for two other properties on the 9-acre site, Plot 2 won the prestigious Luxury House of the Year category at the Scottish Home Awards 2012. Thomas Robinson Architects are executive architects on this project, working with the development's designer, Hugh Petter of ADAM Architecture and developer Scops to create five luxury houses designed in the Scottish Arts and Crafts style. 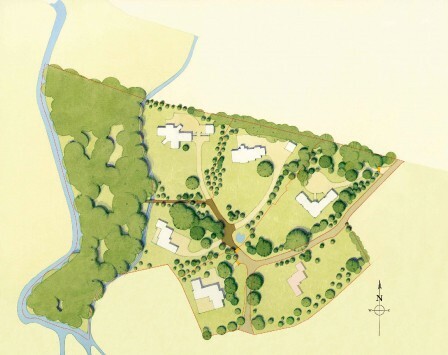 With a strict brief to protect the site from over-intensive development, each of the designs has a unique character and the properties disturb as little of the landscape as possible, preserving the unique qualities of this mature landscape setting. Features include light, flowing spaces designed for modern living, bespoke internal carpentry, external stone detailing and a network of central high-tech cabling for a range of home technology applications. Thomas Robinson Architects' role in the project has involved an incredible level of detail with well over 500 drawings having been produced in order to realise what is an exceptional standard of quality and detail.